Gensburg Markham Prairie (GMP), a high-quality tallgrass prairie and wetland in the Chicago area, is surrounded by high-traffic highways and residential communities. Anthropogenic inputs are a concern given observed ecosystem degradation around the periphery of the prairie. To understand soil quality and the potential for habitat degradation in GMP, we evaluated concentrations of metals and phosphorus in soil profiles, identified possible sources of contamination, and assessed the likelihood that contamination would impact the prairie ecosystem. We collected 15 intact soil cores (to a depth of 120 cm) and 22 surface soil samples (0–10-cm depth), determined the soil type, and measured pH, organic matter, and concentrations of Pb, Cu, Zn, Mg, Fe, K, Ca, and P using ICP-OES. To quantify soil pollution, we calculated the element enrichment factor (EF) and single element pollution index (SEPI) for each sample. We also used principal component analysis (PCA) to interpret relationships between site variables, elemental concentrations, and sources of metals. Heavy metals (Pb, Cu, and Zn) and P were found to accumulate in surface samples. The mean EF values for Pb, Cu, Zn, and P revealed significant enrichment of these elements in the soil profiles. However, SEPI analyses indicate that GMP soils have a low level of contamination. PCA revealed that concentrations are highest for samples with high organic matter content near the ground surface and that Pb, Cu, and Zn have common sources of pollution. We observed enrichment of Pb, Cu, Zn, and P because of deposition from the urban built environment, but the enrichment levels are low enough that they are not expected to negatively impact the ecosystem of GMP. 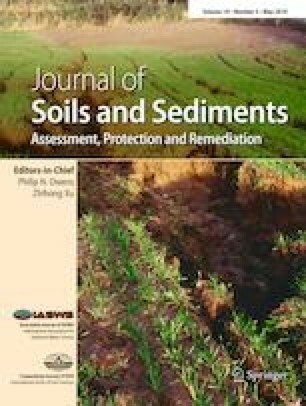 The detailed soil chemistry data constitute a spatial contamination map that can be used to assess potential long-term impacts on the ecosystem, such as reduction of plant growth and species diversity, and inform site management and biodiversity conservation efforts. The online version of this article ( https://doi.org/10.1007/s11368-019-02315-5) contains supplementary material, which is available to authorized users. The authors thank the following people for their help and assistance, especially with the sample collection and analysis: Denzel Akosa, Gabriel Martinez Milian, Alma Bartholow, Julia Standley Pradhan, Adisa Hadzic, Jordan Gurneau, and Diella Packman. We gratefully acknowledge and thank John Legge, who is the Chicago Conservation Director of The Nature Conservancy, and Ron Panzer and Anthony Merisko from Northeastern Illinois University for making this project possible by providing us access to the study site. Sample preparation was performed at the NU General Chemistry Laboratory and elemental analysis at the NU Integrated Molecular Structure Education and Research Center (IMSERC). This material is based upon work supported by the National Science Foundation (NSF) (grant number EAR-1541891), the Illinois Water Resources Center, the Institute for Energy and Sustainability at Northwestern (ISEN), and the Posner Fellowship Program. Liliana M. Hernandez Gonzalez was supported by an NSF Graduate Research Fellowship (DGE-1324585). This research does not involve studies with human participants and/or animals.